Heat oven to 350°F. Spray bottom and sides of 13x9- inch pan with cooking spray. In small bowl, stir coffee granules and water until dissolved, set aside. In large bowl, stir cookie mix, oil, egg and dissolved coffee until soft dough forms. Press in bottom of pan. Bake 10 minutes; cool 15 minutes. In medium mixing bowl, beat cream cheese, powdered sugar, cocoa powder and eggs until smooth; fold in caramels and pecans. Gently spread over cookie base. Bake 30 to 35 minutes, or until set. Cool 30 minutes. 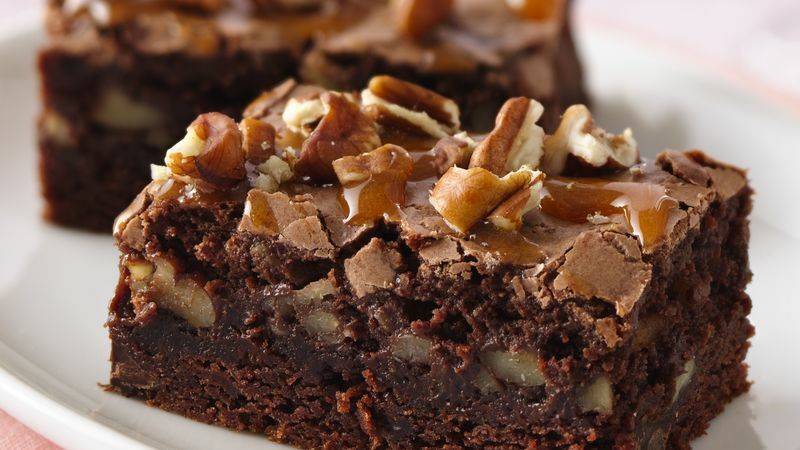 Drizzle caramel topping over bars; sprinkle with pecans. Refrigerate 2 hours or until set. For bars, cut into 9 rows by 4 rows. Store covered in refrigerator. These bars have layer upon layer of decadent chocolate, caramel and pecans, yet are surprisingly easy using the cookie mix. When I served these at a women’s meeting last week there were NO leftovers! Yes, they are that good! Helpful hints – spray knife with cooking spray before cutting the caramel candies and they won’t stick to the knife.